Skin is the soft outer tissue which covers vertebrates. In humans, it is the body’s largest organ, covering a total area of about 20 square feet. It protects our internal organs from the environment using a multi-layered system of cushioning, a cellular barrier, and protective oils. Skin is more than just a protective barrier between our insides and the environment – it also plays an active role in maintaining our health, such as regulating body temperature by sweating and flushing when we’re hot, and raising goosebumps when we’re cold. It can also produce Vitamin D, which is important for the health of our bones, from sunlight. Skin can vary greatly between species, and even between individual people! Here we will discuss the structure of human skin, the proper care of different skin types found among humans, and functions of skin throughout the animal kingdom. We’ll even talk about some functions our own skin performs that we may not know about! This is the layer of our skin that keeps pathogens out, and keeps water in. It is composed of layers of flat cells called “squamous” cells. The term “squamous” means “scale-like,” and describes their flat, squashed appearance. Cell in the epithelium include keratinocytes, which protect us from pathogens, Langerhans cells, which help with immune response if an infection does occur, and melanocytes, which make the pigments that give your skin its color. Most burns and skin injuries are injuries to the epidermis, which can heal quickly. Deeper injuries that also injure the dermis can be more serious. 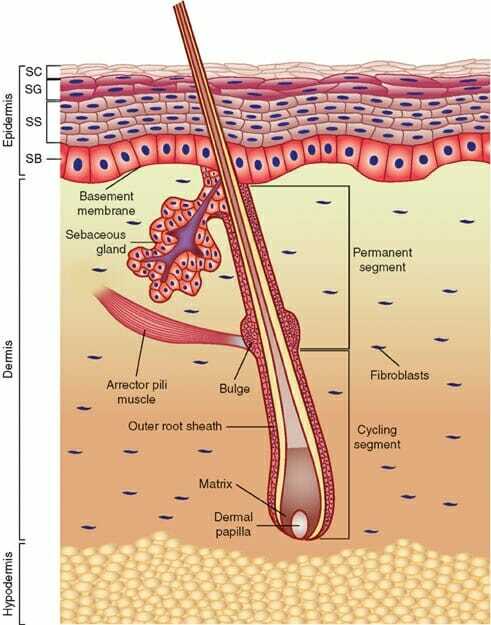 The basement membrane is a thin sheet of fibers between the dermis and the epidermis. It controls what can pass between the two, serving as an additional line of defense against invaders, and an additional guard against loss of water and other vital substances. When skin needs to grow or heal, the basement membrane can become more permissive, allowing water and nutrients to reach the injured epidermis and help with the healing process. The dermis is the deeper layer of skin, which acts as a cushion protecting the body from harsh impacts. It contains many complex structures, including nerves, blood vessels, hair follicles, sweat glands, and “sebaceous glands,” which produce the waxy, oily substance that coats your skin to protect it from environmental damage. While all human skin has basically the same structure, slight biological differences can make a big deal to the proper care and keeping of your skin. People can have more or less active sebaceous glands, more or less active sweat glands, and may store more or less water in their skin. People with oily skin may have large pores, a shiny complexion, and blackheads or pimples. This is because the sebaceous glands in their dermis make a lot of oil, which can build up in pores, widening them and causing irritation. Paradoxically, washing often is not good for oily skin. Many people are tempted to try to wash the oil off – but this can result in the skin feeling dry, which will actually stimulate it to produce more oil! It’s recommended that people with oily skin wash it no more than twice a day and avoid scrubbing when they wash. This will leave the skin’s natural oil intact so that less new oil will be produced. Popping or picking at pimples and blackheads is also a bad idea. This can cause injury to the skin, which can increase the inflammation of the blemish and cause it to take longer to heal! When picking out cosmetic products, look for those with a label that says “noncomedogenic.” That means it won’t clog pores! Combination skin is skin that is oily in some areas, but may be dry in others. In people with combination skin, the chin, nose, and forehead are the most commonly oily areas. Other areas such as the cheeks may be dry. People with combination skin often have large pores, blackheads, and shiny skin due to the production of a lot of oil by the glands in your dermis. This oil can accumulate in pores and cause blackheads and blemishes. The same tips for caring for oily skin can be used on the oily areas of combination skin. Normal skin is skin that has a medium level of oil and water, leaving it protected from the elements, but not shiny or oily. This skin type usually has small pores and few blemishes, since the glands which produce oils are not highly active. People with dry skin may have a dull, rough complexion and may show more wrinkles and lines than other skin types. Irritated red patches may appear, and pores may be completely invisible. This is because dry skin has less active oil glands, leaving the skin without the sheen of protection from the environment. As a result the skin can loose moisture quickly and become red, irritated, or flaky. People who live in dry areas such as deserts are more likely to show signs of dry skin, because their skin loses more moisture than those who live in humid areas. Sensitive skin may show redness, itching, burning, and dryness. Sensitive skin may become irritated in response to certain skin care products. If you suspect you may have sensitive skin, it’s helpful to keep track of what products you have used recently. Discontinue the use of any new products you started using before irritation occurred, and try to determine if you can identify an ingredient in the new product that might have caused the irritation. With luck, you can avoid other products that use that ingredient. All vertebrates have skin, but it can be quite different from species to species. Mammals have hair – strands of protein that grow out of the skin, and which keeps the animal warm by trapping warm air close to the skin. Even humans have tiny, vestigial hairs all over our bodies. Birds have feathers, which play a similar role to hair, but which also enable flight. Birds’ feathers grow from follicles in the skin, just like mammals’ hairs do. Reptiles and fish have hard, protective scales growing from the skin all over their bodies. Amphibians are perhaps the strangest of all. Their thin, permeable skin allows air and water to pass through easily. This allows them to breathe underwater by absorbing oxygenated water through their skin! Some species of amphibian are so good at this that they never develop lungs. Despite the many different kinds of skin, all skin has a few common functions. Our own skin even does some things that we may not realize, which we inherited from our animal ancestors! This is the most important function of skin, for obvious reasons! Skin keeps pathogens such as viruses and bacteria out of our tissues, so that they can only enter through breaks in the skin such as injuries, or orifices like the nose and mouth. Amphibians with very thin skin need to be near water all the time, to keep from drying out. Humans and most other land animals, however, have thick skins that lose very little water. When humans live in desert conditions, their skin actually becomes thicker to prevent water loss to the dry air! Skin is laced with nerves, which communicate information about pressure, texture, heat, cold, pain, and pleasure to the brain. This allows us to respond appropriately to our environment. The skin of humans and some other mammals can lose water on purpose, through the process of sweat. By releasing water onto the skin, the body can cool itself through evaporation. Since the warmest molecules of water evaporate first, the end result is carrying heat away from the body. The body can also encourage heat loss by flushing – allowing hot blood from deep inside the body to flow close to the skin, where its heat will radiate out into the environment. Unbeknownst to many, the human phenomenon of “goosebumps” is thought to be a vestigial temperature regulation response. When we get goosebumps, the tiny arrector pili muscles in our skin are tightening in a way that causes our vestigial hairs to stand on end. If we had thick fur like our ancestors, this would trap extra warm air close to our skin and keep us warm. Some scientists believe that the goosebumps we get in response to fear or other intense emotions may be remnants of a response like that of animals who puff themselves up to appear larger when they are frightened. If we had thick fur, the action of goosebumps standing our fur on end would also cause us to appear larger and more threatening! Many animals have skin which produces colors and patterns specially designed to blend in with their surroundings and avoid being spotted. This is important for both predator and prey species. Prey species can’t be eaten if their predator cannot see them; and predators can’t be avoided if they are invisible to their prey. Many animals’ skins produce a static color pattern, such as the brown color of antelope and deer that mimics the color of dead grass and leaves, the bright green scales of the vine snake, or the dappled muddy scales of the flounder. A few species, however, have evolved skin that goes above and beyond. Chameleons and octopi are among species whose skin has cells that can release different amounts of pigment at will. This essentially allows their skin to act like a TV screen, changing the “picture” to match whatever background they happen to be against. Many animals store fat and water in the tissues of their skin. This allows these material to act as extra insulation while they are sitting around, waiting to be used. Many animals who live in cold climates have taken this ability to the next level, developing thick layers of “blubber” – fat that acts as a barrier between the outside cold and the animal’s internal organs. Our skin and the sweat it secretes can also serve another purpose – acting as a signal to other animals. Many animals mark their territory with their own unique “scent markers” from glands in their skin. Those markers can even contain information about the animal’s age, gender, health, and availability to mate! Scientists now know that humans do this ourselves. Although we don’t consciously process the scent information all around us, our behavior can change subconsciously based on whose sweat we are smelling. People are even more likely to be attracted to each other if they “smell” that they have complimentary immune systems, meaning that their children would have resistance to many diseases! 1. Which of the following is NOT true of the function of skin? A. All animals use their skin to protect their internal organs from viruses and bacteria. B. All animals use their skin to prevent water loss through evaporation. C. All animals use their skin to take in oxygen underwater. C is correct. All animals use their skin as a protective barrier and to prevent water loss from their internal organs. However, only amphibians “breathe” through their skin to a large extent. This allows them to transition between land and water environments. 2. Which of the following would NOT be a concern if you injured your epidermis? A. Without the protective covering of the epidermis, the area might be more vulnerable to infection. B. Pain might result from the stimulation of nociceptor neurons. C. Important structures such as nerves or sebaceous glands may have been damaged. C is correct. An injury to the epidermis often causes pain, and leaves the area vulnerable to infection. However, structures such as nerves, blood vessels, sebaceous glands, and hair follicles are located deep in the dermis. 3. Which of the following is NOT true of oily skin? A. It occurs when sebaceous glands in the dermis produce a lot of protective oil, causing this oil to build up in the pores. B. It can best be treated by frequent washing to remove the excess oil. C. Some people have oily skin on some areas of their faces and bodies, but not others. D. High heat and humidity can make oily skin worse. B is correct. Oily skin should NOT be washed more than twice a day, and scrubbing should be avoided. This is because the body will respond to the removal of its protective oil by trying to replace the oil – causing it to produce oil even faster to keep up with the washes!